If you think that you work hard now, just wait until you become your own boss. You will come to know what the word "sacrifice" means. You'll scale back eating out, buying the latest gadget, and shopping whenever you feel like it. You'll cook at home and eliminate all unnecessary spending. Yes, that well-deserved steak dinner at your favorite restaurant is now an unnecessary expense. Small businesses typically take twelve to eighteen months to break even and three years to generate any profits. And it usually takes four years of focused effort for a business to blossom into a self-sustaining entity. It will take every bit of enthusiasm and energy you have to grow your business into a viable enterprise and a powerful brand. Being a successful entrepreneur is also about having patience. You need to be patient with yourself, your employees, and most importantly, your customers. The sales won't come as fast as you think they should, but if you can just hold on, being an entrepreneur can be your most satisfying professional experience. So the first step is to decide if your cut out to live this kind of life. • You always think there's a better way to do things. • You'd prefer to be in charge. 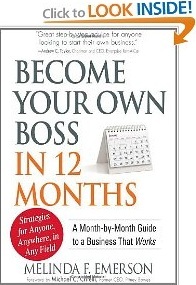 • You think your boss is generally clueless. • You feel underused by your supervisors and dissatisfied by your job. • You know you would do things differently if it were your company. • You sit at your desk calculating the amount of money you make for your employer, thinking that you should be working for yourself. • You are convinced that you could do a better job than the folks that surround you. Entrepreneurs are natural leaders. They are self-motivated and creative thinkers. They can make a decision quickly and stick to it. Entrepreneurs are visionaries, hard workers, and are extremely perceptive. They typically have demanding personalities and are extroverted. They are risk takers who are always seeking to improve upon current conditions. On the flip side, at times such people are often stubborn and impatient. Entrepreneurs are not always good listeners or coachable, and can be territorial.